This image is a blend of 3 flashed frames to pull in the highlights on the table and lamp to the left of the frame and remove reflections of my lights from the wall paint. I added 2 more frames to darken the windows on the left and brighten the window on the right (which was considerably darker since it was under a deck). I also lit the hallway and dining room, both reflected in the mirror, to brighten up the mirror reflection to match the brightness of the rest of the room. And finally, I blended an ambient frame to give a natural feel to the light. I then color corrected the shadows on the far right wall, removed electrical outlets and cords, and flattened the rug where it had bunched under the couch. Total images used to create this image: 8. Shooting for interior designers is one of my favorite things in the world. Together we get to geek out over every detail of the shot, moving this, turning that, until every element is in exactly the right spot in the shot. 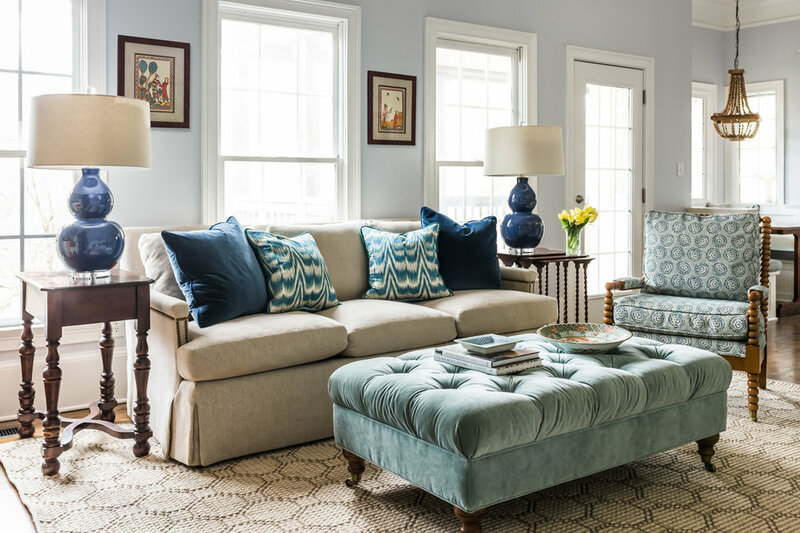 The best, for me, is when I get to shoot for a designer or decorator whose work uses bright color and carefully selected elements to create a space that I would love to inhabit. Alexa Stevenson is one of those designers whose work I appreciate so much that I would gladly inhabit any of her spaces. I could cozy up on that couch with a book and a cup of tea for hours! Check out more of her work on her website. This image is a single shot of a detail of the room using natural light supplemented with my strobes in 2 places to preserve the existing shadows of the lamp on the wall and maintain dimensionality. This is a blend of 3 images - 1 to pull the highlights on that lampshade, 1 natural light supplemented with strobes, to get it bright and crisp with the windows where I want them, and a 3rd straight ambient shot to enhance the natural feel.